/ Kiss the boring BI conference goodbye. Hello Domopalooza! On April 7-9, Heather (our CMO) is giving birth to our first-ever Domo user conference and we’re calling it Domopalooza. We deliberately chose a name that communicates that this isn’t the same snoring conference you’ve been invited to year after year. At Omniture (the company I co-founded before Domo), we created THE analytics event for marketers and had incredibly loyal customers who attended our user conferences year after year. 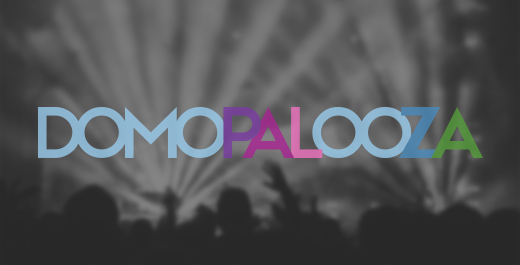 We intend to create that same informational and addictive experience for customers with Domopalooza. You can be assured that Domopalooza will be more than just another industry conference. There will be incredible content and learning opportunities. Attendees will be inspired by stellar keynotes, learn best practices from industry trailblazers, participate in hands-on trainings, and witness first-hand the unveiling of never-seen-before functionality in the product. Let’s be honest, a great conference isn’t just about amazing content and educational opportunities. Some of the most valuable moments come from the people you meet and the connections you make. So while there will be plenty “get smart” time on the agenda, we’re making sure that after the work, there’s plenty of time to make the memories. During the week of Domopalooza, we’ll also be coming out of stealth and share with the rest of the world how our business management platform is truly transforming the way business is managed. We’ll also be unveiling for customers new features and functionality that we’ve been holding back. Believe me, this will be an epic event. You won’t want to miss it. We’ll hope you follow us on social media as we start sharing our incredible lineup of speakers and more details about the event. To register and stay up to date on the program, check out http://bit.ly/1ICTSD8 and follow #DP15 on Twitter.